What started out as a casual conversation with a New York Times bestselling author over eight years ago has turned into the most exciting and rewarding job I could have ever dreamed up. It was in 2011 that I was chatting with Frances Mayes (Under the Tuscan Sun), when she invited me to come visit her in Tuscany if ever I were to plan a trip to Italy. She clearly didn’t know me well enough to know that I wasn’t about to let that invite slip through the cracks. And then, a light bulb moment, when the thought popped into my mind at that precise moment that if I would enjoy visiting her in Tuscany, wouldn’t her legions of fans as well. 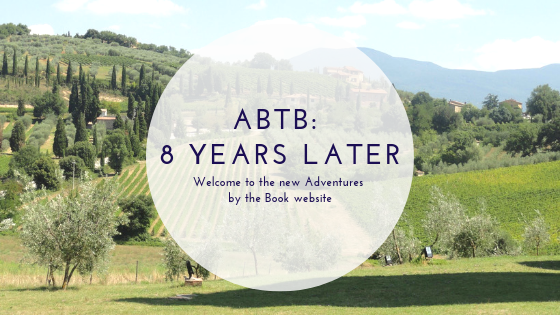 The seed was planted, and a few months later, I left my job to launch Adventures by the Book with our first international adventure to Tuscany to meet up with Frances, as well as another 6-8 Tuscan-based authors, whom providence handed to me on a proverbial silver platter. Eight years later, you dear readers, or Adventurers as we affectionately like to call you, have continued to reinforce the idea that our unique brand of author events are meaningful, fun, connective, and inspiring. We have sipped champagne together at elegant teas, we have cooked together, celebrated book launches and happy hours, chocolate and wine tastings, experienced ethnically diverse meals, and traveled around the world to Asia, South America, Europe, North America, and soon Africa will mark our fifth continent as we head to Morocco. We have educated and inspired, made new friends, discovered some pretty fabulous authors and books, and grown together. We have laughed together and cried together, and all the while, felt a connection that is made possible through books and the amazing and inspirational authors who have written them. As we launch our updated website and head into the end of our first decade of business, I want to take this opportunity to thank you for believing in Adventures by the Book, and for sharing our mission to connect people and communities, one book at a time!